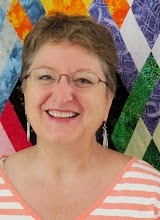 This week on the podcast we have The Quilt Pattern Magazine's EQ7 expert Reeze Hanson on the show. She'll break down the myths of EQ7 being hard or unattainable for many by giving us her 5 tips for getting started and avoiding the overwhelm that has caused some quilters to try it out and then set it aside and give up. If you own EQ software, but have never used it, she'll have you inspired to get educated and give it another try. And if you don't own it, then send me your Quilter's corner story so you have a chance to win a full EQ7 software on July 3rd. You don't want to miss out! This is the perfect lead in show for the 1 year Anniversary special on July 3rd because it will get you understanding what EQ7 is all about and get you inspired to give it a try. So grab a cup of tea and join me this week on CQT Episode 50 where we’ll talk about busting the myths of EQ7 and show you that it's simply a program that thinks just like quilters do. Holly talks about her beginnings of quilting in university in the early 70s and how she made quilts for her kids, grandkids and more - she's come along way baby! Congrats Holly - you have won a one year subscription to The Quilt Pattern Magazine.